Social and Emotional Development - Calvary Children's School, Inc. In February, we agreed to receive coaching through the Early Childhood Mental Health grant, which we were offered because we are part of Virginia Quality (www.virginiaquality.com) This grant helps administrators implement a system-wide approach to behavior management that is consistent with our policies and procedures and facilitates social and emotional learning for our students. Our team is excited to continue focusing on the positive behavior of our children. In the fall of 2017 we will begin to implement the Pyramid Model for Supporting Social Emotional Competence in Infants and Young Children, a conceptual framework of evidence-based teaching practices developed by the Center for the Social and Emotional Foundations for Early Learning (csefel.vanderbilt.edu). The foundation for all of the teaching practices in the Pyramid Model are the systems and policies necessary to ensure the staff is able to adopt and sustain these practices. The practices are organized in the following 3 learning modules: (1) universal supports for all children through nurturing and responsive relationships and high quality environments; 2) targeted social emotional strategies to prevent behavior challenges; and 3) individualized intensive interventions for children with persisting behavior challenges. 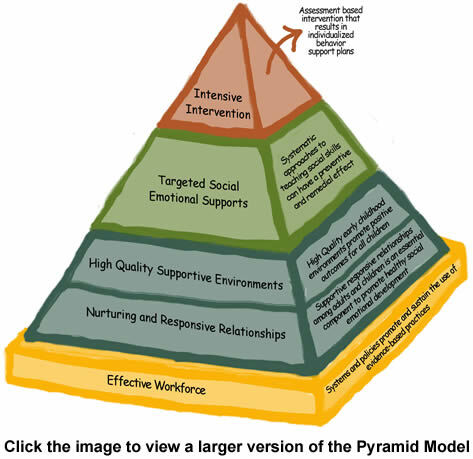 Although our staff attended trainings on the Pyramid Model several years ago, and have infused most of its concepts in our program, we plan to implement the model more in the fall. Our staff has agreed 100% to participate in this initiative and to receive training to improve their skills. Many programs throughout Virginia are implementing the Pyramid Model, supported by Early Childhood Mental Health Virginia (www.ecmhva.org), which has funded the training and coaching. The Pyramid Model has a wealth of resources for parents to support children’s social-emotional skills through daily routines in the home. We look forward to sharing these resources with the families in the program, and to receiving your feedback. Thank you in advance for your support and active participation! If you would like more information on how to be involved, please get in touch with Beth (bposey@comcast.net).